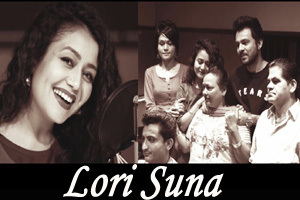 Beautiful song dedicated to mothers are sung by Sonu Kakkar, Neha Kakkar and Tony Kakkar featuring them and their parents in song video. The video of this song is available on YouTube at the official channel Desi Music Factory. This video is of 7 minutes 44 seconds duration. Lyrics in Hindi (Unicode) of "लोरी सुना"